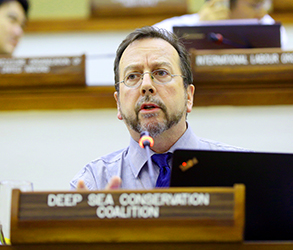 Speaking at the August 2017 annual meeting of the International Seabed Authority (ISA), the Deep Sea Conservation Coalition (DSCC) called on state parties to open closed doors, bring transparency to the heart of its work and to put into place an Environment Committee to address the obligation of the ISA under international law to “ensure effective protection” of the marine environment in the face of increasing demand to explore the seabed in areas beyond national jurisdiction. Matthew Gianni delivers an intervention on behalf of the DSCC © IISD/ENB | Francis DejonThe meeting today concluded a two-year review to assesses how the ISA needs to adapt its structure and working methods to meet the challenges of managing the impacts of industrial mining across wide areas of the deep ocean floor, while ensuring it fulfills its responsibility to act in the common interest of all humankind. While some progress was made on transparency, in particular the “affirmation” that “non-confidential information, such as that relating to the protection and preservation of the marine environment should be shared widely and be readily accessible” and “encouraging’ the ISA’s Legal and Technical Commission to hold more open meetings, it fell short on specifics including the failure to establish an environmental committee that would ensure transparency and address the many scientific uncertainties surrounding potential impacts of mining on deep-sea ecosystems. The urgent need for an Environmental Committee was highlighted when the DSCC brought to the attention of the ISA their approval of a claim by Poland that was in fact in an area in the mid-Atlantic Ridge which has been tagged by the Biodiversity Convention as an Ecologically or Biologically Significant Area (EBSA). Many governments and company contractors are already exploring for minerals in the deep sea, under exploratory licenses issued by the ISA. During the meeting, the ISA agreed for the first time to a target date of 2020 to finalize the regulations to govern commercial deep-sea mining in the international area of the seabed. If the ISA meets this target, large-scale commercial mining of the deep seabed could begin in international waters within a few years, assuming market conditions are favorable. “A number of deep-sea scientists have recently concluded that biodiversity loss will be unavoidable if deep-sea mining is permitted to occur and that this loss is likely to be permanent on human timescales given the very slow natural rates of recovery of affected species and ecosystems in the deep-sea.” said Matthew Gianni, co-founder of the DSCC “The international community needs to ensure that it doesn’t open up a whole new frontier of environmental degradation and possible extinction events in an area of the planet that has largely been untouched by human activity until now.” Gianni added.